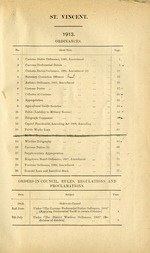 Some of the printed acts were issued with continuous page numbering, starting over with page 1 each year. 2 Customs Preferential Duties ..
4 Summary Conviction Offences -, .! 6 Customs Duties .. ..
7 Collector of Customs ..
9 Agricultural Credit Societies ..
12 Capital Punimiihn-nt. Amending Act 1868, Amending .. . Pensions Ordinance, 1902, Amendment . 2nd June Under "The Customs Preferential Duties Ordinance, 1913"
Illnil.r "The Clstollis Pr 4-fe" ntiHl Dnuti.S. O)riuance, 1912"
T_' h..-r "'Tn.i (C'ustn,-. IPi. Ore,.tinl Duti.-- Onrlianfl f, :91:3"
_nihr,- ""Tli ('iu-.l, iir 'rrfeiintial Duti I i liirani.-, l. l ;"
UTiider The Agri.culturial Credit Swietie. (IOrinuaiicr, 191:'"
Under "The Exciie Ordinanee 1911" (Warulh'ue dues) ..
For Jovcernmnrit i.t tihe Government Cotton Ginnery .. Under "The Agricultural Credit Societies Ordinance, 1913"
Under "The AgricuLltuial Credit Societies Ordinance, 1913"
Under "The Small Tonns. Regulation Ordinance, 1878"
Substituting 26th for 24th May ab Victoria Day"
Date. Su object. I Paie.